Michael Vinagro, left, and Dagnir Pina, were both arrested following a brawl between two semi-pro football teams on Sunday night. 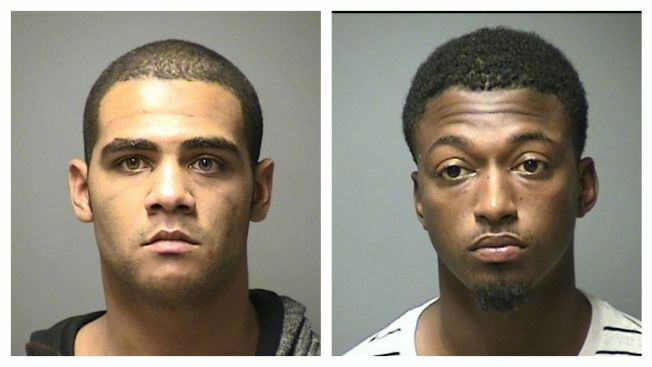 Two men were arrested on Sunday night after a brawl broke out between two semi-pro football teams in Manchester, New Hampshire. Michael Vinagro, 26, of Manchester, is charged with second degree assault. He was released on $2,000 bail and is scheduled to appear in court on Oct. 21. Dagnir Pina, 25, of New Bedford, Massachusetts, is charged with disorderly conduct. He was released on $500 personal recognizance bail and is scheduled to appear in court on Oct. 22. Police said they were called to the scene of the West Memorial Field near West High School around 6:15 p.m. They immediately noticed multiple pockets of players "going at each other." Vinagro, who was playing for the New Hampshire Wolfpack, allegedly struck a 25-year-old New Bedford, Massachusetts, man who was playing for the Whaling City Clippers with a helmet, knocking him unconscious. The victim was treated by emergency personnel at the scene and refused further medical treatment. Members of each team continued to verbally insult one another as additional police units arrived at the scene and the New Bedford players boarded their bus. Pina refused to leave the parking lot and was also arrested. "I think it's frustrating for not only people watching hte game, but officers on scene did indicate there were a multitude of players that were respectful and were sorry for the actions of a few players," Manchester Police Lt. Brian O'Keefe said. "It only takes a couple small apples to ruin an entire bunch. Ultimately, that's what happened last night." Police said it is unknown what prompted the altercation.